This is a collective haul of all the Essie's I've purchased in the last few months. I wanted to get this post up because I've got another big order on it's way (with the Winter 2015 collection in it...eek!) and I can't wait for that order to get here and share it with you. Just as a side note: I realize this is a ridiculous amount of polish for one person to get over a few months time. Over the past year or more, I've gone from being an "I wear nail polish and love Essie" kind of girl, to a full-on Essie collector. I've started picking up shades just because they are classics, popular shades I don't own yet or because I want to review or compare them to other Essie polishes in my collection. I'm really enjoying my collection and blogging about it and sharing my thoughts with you all, here and on Instagram. So lets talk about some recent additions to that collection, shall we? I have plans to post a review and comparison post on both of these polishes closer to Winter. I will say that I've worn Tuck it in My Tux a couple times already and I'm obsessed with how clean and classic it looks. I haven't yet worn Double-Breasted Jacket but I'm in love with this shade of red. I've had a few requests for red polish comparisons as well as a comparison for reds from the new Winter collection, so this polish for sure will be posted here in the coming months. I had a reader request me to compare some Essie light blues (post here) and I LOVED that idea, so I went to Walmart and picked up Borrowed & Blue (a wedding collection colour I've always wanted) and Bikini So Teeny. While I was there, I noticed that Mint Candy Apple looked different than my bottle at home so I bought that one for another comparison. 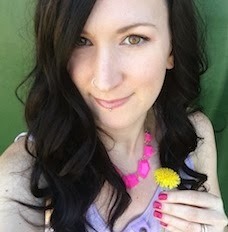 Angora Cardi became a quick fall favourite and I ran out to my local small town pharmacy to buy a bottle for $10.49 even though that is waaaaay more than I usually pay for my Essie's! I just felt strongly it needed to be included in my Fall 2015 Polish Picks because the colour is so on-point for this season. I have a full swatch and review post on this polish here. And of course I had to get the new Fall 2015 collection! I was drooling over promo pics of this collection in the summer and was super stoked to find it on sparklecanada.com for such an amazing price. I roped some friends into getting in on the order with me so we could spend $75 and get free shipping, so the other two polishes I ended up putting in my cart were Dive Bar and French Affair. Both had been on my wish list for awhile now, so I was happy to add them to my collection. If you missed it, I have a full review of all 6 polishes from the Leggy Legend Collection as well as a comparison post (where Dive Bar got a little moment in the spotlight). I also have a review and swatch post of French Affair. I thought I would also give you a review on my experiences ordering from sparklecanada.com. They carry only a few major polish brands (i.e. Essie, OPI, China Glaze & CND) but they have a huge selection within those brands. For the Essie's alone, there's over 300 polishes so you are almost guaranteed to find a polish you are looking for. The other major plus is that the Essie's are only $5.84! That's half the price of what I can find in my local drug stores and even cheaper than finding random Essie's at Winner's where they are usually $5.99. I paid the same for those three blue/mint green polishes at Walmart as I did for the ENTIRE 6 polish Fall collection from Sparkle Canada. Amazing. You can also get an additional 12% discount if you register and login, then rate/review a few polishes. 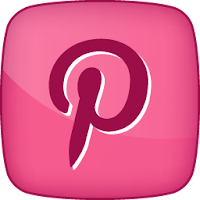 They'll give you 3% discount for every review up to a maximum of 12%, making the polishes even more inexpensive. Since I've always ordered $75 worth of polish to get free shipping, they will also tack on a "group discount" when you order that much polish, which is usually around another 10%. The other thing I love is that they have their upcoming collections posted quite early, sometimes up to a month earlier than seeing them in stores. There are however, a couple drawbacks. The first being that you have to order $75 worth of nail polish to get free shipping. If you aren't a crazy nail polish hoarder like me, this can be really hard to do. If you pay for your own shipping, you are looking at at least $20 in shipping fees which eliminates all the savings you just had on the polish. So to me, it's only worth it if you can hit that $75 mark. If you can find a few friends to order with you, this can help alleviate the issue. The other issue I've had is that shipping is not quick and I'm sometimes left waiting awhile for my polish. My first order with them was the quickest I've ever received my order, which was two weeks. My second order didn't arrive at the two week mark, so I thought maybe it needed a few more days to arrive. By the three week mark it still wasn't here so I emailed the company. They replied swiftly and told me my order had been lost, but they would send it out that same day. It took two weeks to arrive from that point, so all in all it took 5 weeks before I received it. My most recent order took an entire week before it was finally shipped to me, but when I emailed to ask them about it, I got a very quick reply. They said they were currently very busy and a little behind on orders, then promptly shipped it to me using expedited shipping, making it get here in just over two weeks (they also threw in a set of OPI mini's for free!). My impression is that it's a small company that is growing and they are adjusting to keep up. - some polishes are inaccurately named (i.e. : "Bouncer It's Time" instead of "Bouncer It's Me", "Typing the Knotie" instead of "Tying the Knotie", etc) which could make it difficult if you were searching for something in particular. - twice I've been able to order a polish, put it in my cart and check out only to be emailed weeks later to be told that polish is sold out and I was refunded my money. Which is totally fine, I was refunded and all, but the polish I ordered "Coat Couture" is still saying it's in stock on their website. Either it's actually out of stock and they still haven't updated their website, or it's in stock and I just didn't get my polish. With all that being said, I have been happy once my polish gets here and I will continue to order from them, because Essie's for 5 bucks is hard to pass up! Has anyone else ordered from sparklecanada.com? What were your experiences? Hi Kindra, I've been reading for awhile but haven't commented yet. Wanted to finally chime in with a couple of things - first, sure it's a lot of polishes to buy, but not for someone who writes an Essie blog! Don't feel like you owe an explanation. It's a business expense! Second, I love Tuck it in My Tux. I feel like when it first came out, a lot of people were negative in their reviews, but I really prefer it to a totally opaque stark white. Finally, is your new Mint Candy Apple different on your nails than your other bottle? I feel like mine is actually green, instead of the blue pretending to be green color that MCA is infamous for. Thanks for commenting! You are so right about Tuck it in My Tux. 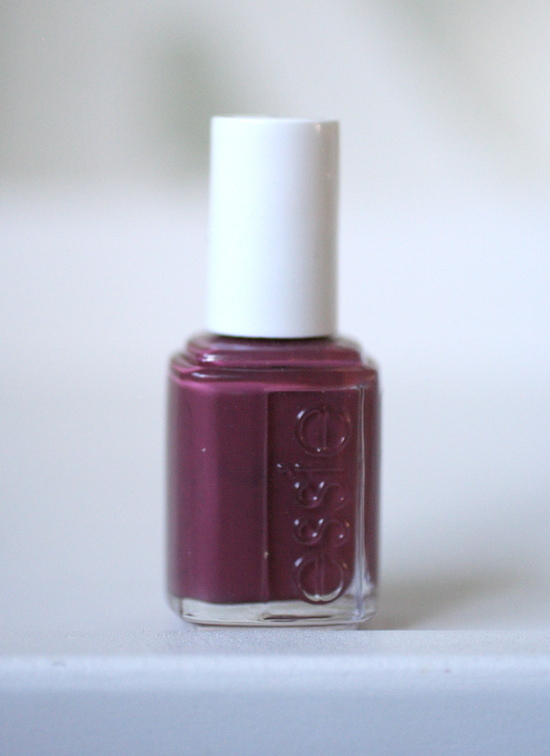 It could possibly be up there in my top 5 favourite Essie's of all time. I'd like to see how it compares to Marshmallow but I don't own it yet. And yes, my new bottle of Mint Candy Apple is straight up different! When did you buy your bottle? This new bottle is totally green, comparable to Fashion Playground, whereas my old bottle is blue. 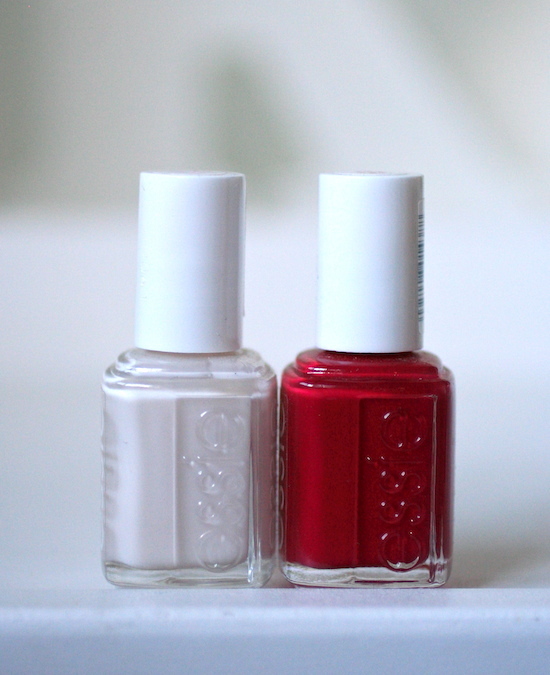 I'm doing some research to see if Essie changed the formula, but I will definitely be posting a comparison post soon!